The best briefs are succinct and clear on what you are trying to achieve. 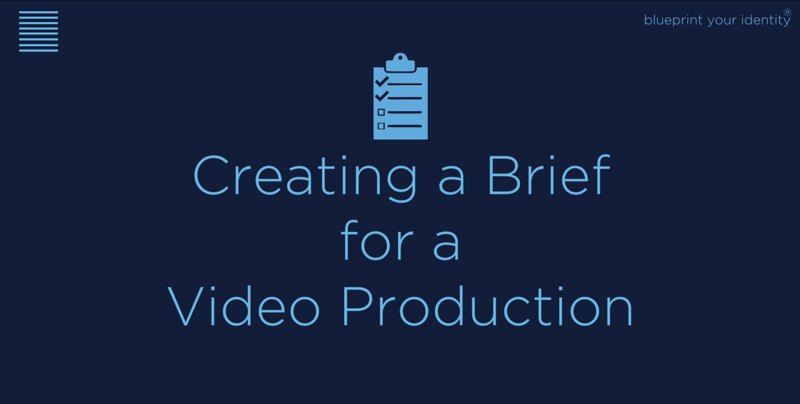 Think of the project as a campaign instead of a single, stand-alone video. This will help you think more broadly about what needs to happen before and after people watch the video. For more information visit Introduction to Video Marketing for Business. There are a few things which you should be clear on from the start. Business Objective - What are you trying to achieve? What is the best outcome for the video and campaign? Communications Objective - What do you want to say? Messages - Isolate three to five key messages you want to convey through the video. Themes - What are the best themes to help you reflect these messages? Journey - Identify the key events and basic structure which you would like the piece to include. Tone & Brand - Identify the tone relevant to your business and audience. Stats - Present key information and figures that support your thought process. References - Present visual examples and other projects that represent what you are trying to achieve. It is important that everyone in the team shares their thoughts, so you all have the same understanding of the project and ensure there are no surprises later. Don’t limit or restrict a project by only using one example, as you need the creative treatment to evolve freely. Where possible, also use examples of what you don't like. Script - Write a script for the piece. This might not make it into the treatment but it can still be used as an important reference. Timing - Identify when, why or what you need the piece for.